Cut is the factor that fuels a diamond’s fire, sparkle and brilliance. Cut refers to the facet proportions on the surface of a diamond. More than any other factor, the precision of these facets determines the beauty of the stone. But without this precision, a diamond wouldn’t be nearly as beautiful. The allure of a particular diamond depends more on cut than anything else. An understanding of diamond cut begins with the shape of a diamond. The standard round brilliant is the shape used in most diamond jewelry. All others are known as fancy shapes. As a value factor, though, cut refers to a diamond’s proportions, symmetry and polish. The proportions of a diamond refer to the relationships between table size, crown angle and pavilion depth. A wide range of proportion combinations are possible, and these ultimately affect the stone’s interaction with light. Clarity measures the flawlessness of a diamond. 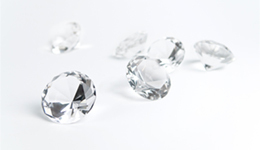 A diamond’s clarity rating has a direct effect on a diamond’s beauty and price. Virtually all diamonds have imperfections called inclusions and blemishes. Carat weight alone does not determine a diamond’s value. Two stones of equal weight can vary widely in price because of quality differences. In fact, a smaller diamond may actually be more beautiful than a larger stone depending on the other members of the Four C’s: clarity, color and cut. Because even a fraction of a carat can make a considerable difference in cost, precision is crucial. In the diamond industry, weight is often measured to the hundred thousandths of a carat, and rounded to a hundredth of a carat. Diamond weights greater than one carat are expressed in carats and decimals.